Understandably, the biggest and most expensive transfers of the summer in the Premier League and beyond get the most attention. But while the focus of the footballing world is fixed firmly on the show-stopping, money spinning deals, plenty of other interesting global transfers often go more or less unnoticed. To help shine a line on the deals that have flown under the radar, here is a rundown of some of the more interesting foreign transfer stories you might have missed. Portuguese holding midfielder William Carvalho was once the transfer darling of the English media. Carvalho was perennially linked with a move to the Premier League with Arsenal, Man Utd, Liverpool, Spurs, Chelsea and Man City all earmarked as potential destinations for the then promising up and comer. Really, Carvalho never fully kicked on from his promising beginnings and at 26, the 47-times capped international has finally got himself a move. Carvalho signed for Spanish sleeping giants Real Betis this summer, moving east across the Iberian Peninsula for approximately £18m. 26-year old Dutch international centre half Stefan de Vrij swapped Rome for Milan this summer, moving from Lazio to Inter on a free transfer after his contract expired. The seasoned stopper had established himself as one of the top players in his position in Serie A since he arrived on Italian shores in 2014. De Vrij is comfortable with the ball at his feet, aerially dominant and a genuine threat from set pieces. The Dutchman scored 7 times for Lazio in total last season. A high calibre international centre back available for nothing? Where were Mr. Mourinho and Mr. Woodward? It seems a lifetime ago that floppy-haired Brazilian twins Fabio and Rafael exploded on to the scene at Manchester United. The fullbacks enamoured everyone with their enthusiasm and energy, though Rafael made more of an impact on the United first team than his brother. Fabio did start in United’s 2011 Champions League Final defeat to Barcelona however, before moving to QPR, Cardiff and Middlesbrough respectively. This summer, Fabio has moved to Nantes in Ligue 1 for a nominal fee. Nantes is just 6 hours west of Lyon, where his sibling Rafael lives. United fullbacks re-united in France. Nice. (Well, Nantes……..or Lyon – but you know what we mean). Like many football veterans nowadays, long-serving Premier League stalwart Jose Fonte was lured to China in February of this year, signing for Super League club Dalian Yifang for an absurd weekly wage. Fonte played just 7 times for the Blue Hawks before joining up with the Portuguese national team for their unsuccessful World Cup adventure in Russia. The 34-year old “mutually agreed” to cancel his contract with Dalian Yifang shortly after the World Cup ended and the former West Ham and Southampton defender then chose to sign for Lille in Ligue 1. Swedish World Cup captain Andreas Granqvist made headlines in Russia for choosing to stay with the team instead of flying home to witness the birth of his second child. His unwavering commitment to the national team was praised, though now it looks like he’s been summoned home permanently. Granqvist started his career at Swedish club Helsingborgs and now after a lengthy career that saw him play in England, the Netherlands, Italy and Russia, the 33-year old has come full circle. Granqvist’s contract at Helsingborgs includes a role as a sporting director at the club once he hangs up his boots. Legendary midfielder Gabi had been at Atletico Madrid since the age of 12, transitioning up through the underage ranks at the club before making his first team debut in 2003. After spells at Getafe and Zaragoze, Gabi returned to Los Colchoneros in 2011 and went on to play over 250 times in La Liga for his boyhood team. Even at 35, Gabi was heavily involved last season, racking up a little under 50 appearances in all competitions for Atletico. The Spaniard capped his Atletico Madrid career in style, slamming home the 3rd goal in the club’s 3-0 win against Marseille in the 2018 Europa League Final. Gabi opted to move to Qatar this summer with Al Saad, but he has already revealed plans to return to Atletico in some capacity in the near future. Keisuke Honda is a sporting icon in Japan. 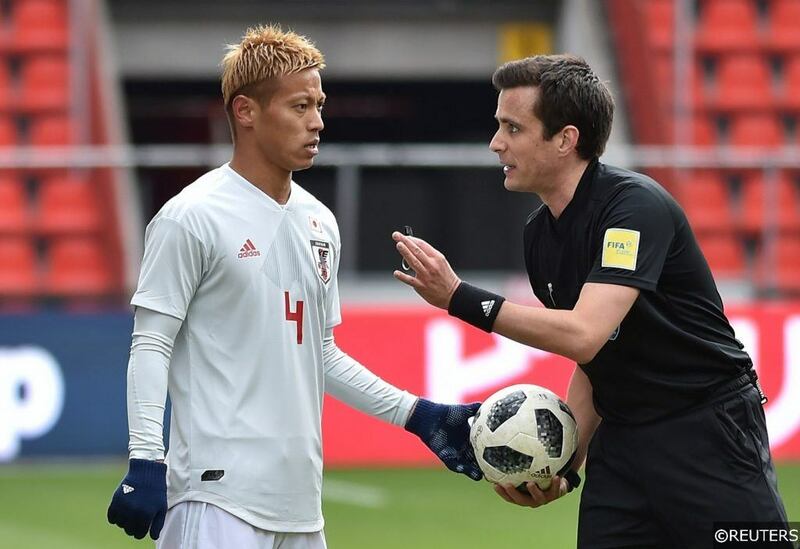 The attacking midfielder has been capped 98 times by the Japanese national team and this summer, Honda competed at his 4th World Cup tournament. Honda’s group stage goal for Japan against Senegal made him his country’s top World Cup scorer of all time. The former CSKA Moscow and Milan star surprised many by announcing his intention to join Australian A-League side Melbourne City this summer. Honda is still just 32 and the free-kick specialist’s arrival in Australia can be considered quite a coup for the league. Honda has just come off the back of a fine season with Mexican side Pachuca, where he scored 10 times in just 29 Liga MX appearances. Monaco’s transfer policy over the past half a decade has drawn envious glances from bigger clubs across the continent. The French club’s track record of plucking unknown players and rough diamonds from relative obscurity and transforming them into world beaters is almost unmatched. This summer, Monaco sanctioned a £18m move for Lyon’s 16-year old attacker Willem Guebells. The teenager has already played in Ligue 1, becoming the first player born in the 21st century to appear in French top-flight fixture. Guebells also became the youngest ever player to appear in the Europe League last season and there is hope at Monaco that his career trajectory can develop along the same lines as Kylian M’Bappe’s. Nani will forever be associated with inconsistency. The Portuguese winger regularly mixed the jaw droppingly brilliant with the bafflingly dreadful during his 7 seasons with Manchester United, though he did leave England with 4 Premier League winners medals, 2 League Cup medals and a Champions League winners medal – not bad really. His career has been in something of a tail spin since leaving United in 2014 and after spells at Sporting CP, Fenerbache, Valencia and Lazio, Nani has returned to where it all started again this summer. Nani takes his box of medals and his 112 senior caps with Portugal back to his spiritual home at Sporting CP, re-joining the club while simultaneously giving fans a good news story during a tumultuous period for the Leões. Like Monaco, Borussia Dortmund’s scouting network and recruitment record is the envy of many. It feels fitting then, that their latest unearthed gem has an association to Monaco, and with both the French club and BVB involved in his development, Abdou Diallo seems destined for big things. The 22-year old central defender is a cultured left-footer who enjoyed a break out season with Mainz in 2017/18, earning rave reviews for his physically dominant and tactically intelligent performances. After just one full campaign in the Bundesliga, Borussia Dortmund has seen enough and moved quickly to secure Diallo’s services before interest from elsewhere in the centre half started to intensify. Diallo is the current French U21 captain, showing that he has leadership qualities to complement his other attributes. Don’t be surprised to see Diallo move to England in few years for 3 times what Dortmund have paid for him this summer. Categories: Blog, Football, Transfer Done Deals, and Transfer News. Tags: Atletico Madrid, Middlesbrough, transfer news, and transfers. Team Tag: Atletico Madrid, Borussia Dortmund, lyon, and monaco. League: England Premier League, French Ligue 1, German Bundesliga, Italian Serie A, and Spanish La Liga. Sports: Football.